Community is an American television sitcom created by Dan Harmon about a suspended lawyer who is back in school after his college degree is deemed invalid by the State Bar, and his experiences attending fictional Greendale Community College in Greendale, Colorado. At the centre of the group is Jeff Winger (Joel McHale), a fast-talkin' lawyer whose degree has been revoked. With some help from his fellow classmates, Winger forms a study group who eventually learn more about themselves than their course work. Also among the series stars who comprise the group are comedy legend Chevy Chase as Pierce, a man whose life experience has brought him infinite wisdom; Gillian Jacobs as Britta, the 28-year old drop out with something to prove; Yvette Nicole Brown as Shirley, a sassy middle-aged divorcée; Danny Pudi as Abed, a pop culture junkie; Alison Brie as Annie, a high-strung perfectionist; Donald Glover as Troy, a former high school football star trying to find his way and Ken Jeong as Spanish professor, Señor Chang. 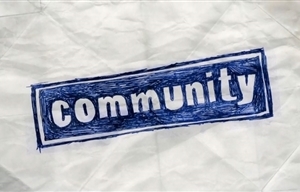 Community is a Krasnoff Foster Entertainment, Harmonious Claptrap, Russo Brothers production, Universal Media Studios production in association with Sony Pictures Television. Russ Krasnoff, Dan Harmon, Joe Russo, Anthony Russo, Garrett Donovan, Neil Goldman and Gary Foster serve as executive producers. Joe and Anthony Russo directed the pilot, written by Harmon.